Its an intimate day with just Scott & Jake in studio and the bromance go WAY over time and give you an XL episode diving deep into all the week's wrestling news as well as everything happening in WWE this week! They discuss a late Tag Champion, Tribute to the troops, the future of Matt Hardy, the XFL, Bane Ambrose, Former Tag Champions Rhyno & Slater, Asuka being added to TLC and the NEW Daniel Bryan and more! All that plus YOUR hotline questions and a wellspring of fun, uncensored and enlightening conversation. Its a chill day with Jay, Scott and Jonny in studio with Dale on the line. The quartet cover Walter's new contract, NXT UK's first Takeover in Blackpool where the brand began, ALL ELITE WRESTLING trademarks, and the continued fallout in WWE from Roman Reigns leaving due to illness and the events of Survivor Series. All that plus the New Daniel Bryan, Charlotte's explanation of her actions against Ronda Rousey, and YOUR calls to the Compadres Hotline! Jay, Scott and Jake are in Studio with Dale on the line just days after a JAM PACKED weekend of WWE Events in LA. The quartet discuss their experiences at NXT TakeOver War Games 2 and WWE Survivor Series. From the small but mighty card of War Games to the superstar studded Survivor Series which featured a viscous fight between Ronda Rousey and Charlotte, and uncomfortable fight between Brock Lesnar and Daniel Bryan, and a downright rage fueled fight between Scott Narver and Enzo Amore! All that plus the Compadres Hotline and the first matches announced for TLC! Jay, Scott and Dale are in studio the trio discuss the drastic changes to this upcoming weekends WWE Events including the injury that took Smackdown Women's champion Becky Lynch out of the event and the Major single's title that changed hands at the cost of further damage to AJ Styles' family jewels. They lay out their predictions for NXT War Games and Survivor Series, take your calls from the Compadres HOTLINE and more! Crown Jewel Backlash, Survivor Series Shapes Up! Jay, Scott and Jake are in studio with Dale on the line and quartet covers all the recent wrestling news including Jeff Jarrett's lawsuit, Sonjay Dutt & the original Survivor Series plan rumors and more. Then they share their thoughts on this past week's controversial international WWE event, Crown Jewel and cover the backlash both in kayfabe and reality the event may or may not have. They also chat about this weeks Raw & Smackdown live, the highlights and missed opportunities leading up to the Brand vs Brand Survivor Series which already has 7 matches on the card! All that plus NXT Takeover War Games, Impact Wrestling, your calls from the Compadres HOTLINE and Dale's connection to Snoop Dog! Jonny, Scott and Jay are in Studio talking all about this past weekend's historic WWE Evolution PPV. The first ever all women PPV (put on by WWE of course) featured 50 women from the past and present, 3 title matches and a 20 woman battle royal and the Compadres discuss what they thought of the shows presentation, matches and more! Also we take some calls from the Compadres HOTLINE. Roman Reigns, WWE Evolution Preview, plus Sinn Bodhi Interview! Scott and Jay are joined in studio by writer, director and host of NJPW Marc Warzecha this week to discuss the absolutely blindsiding news given by Universal Champion Roman Reigns on Raw. They dive into the shocking situation and discuss the impact it may have on the company, industry and fans. 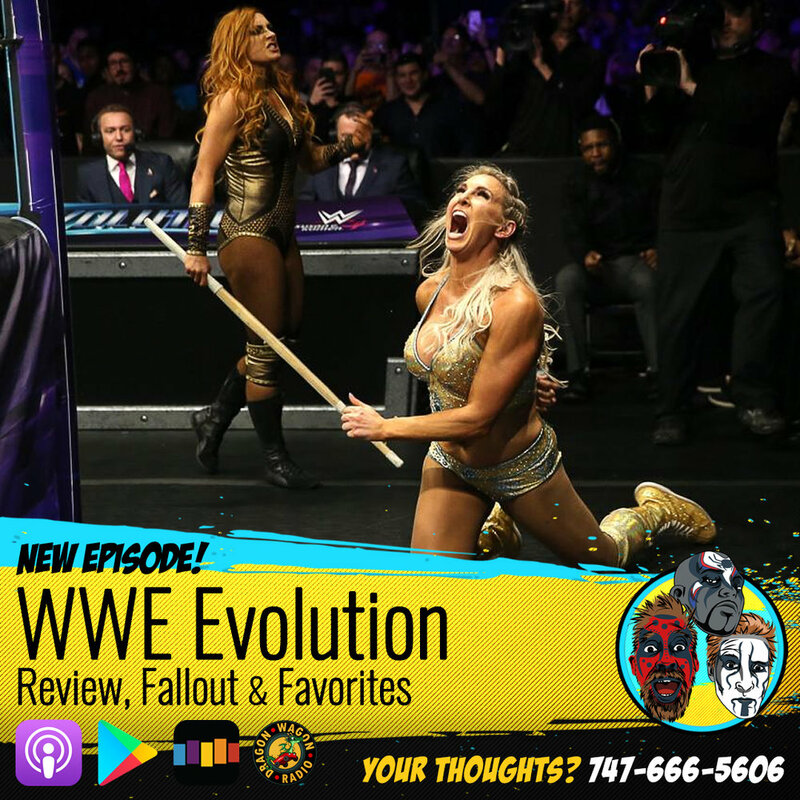 They preview this weekends historic all women's PPV, WWE Evolution and speculate on everything, take some of your calls to the Compadres HOTLINE, AND the Warlord of Weird, Sinn Bodhi is on the line to talk all about what he likes and dislikes about modern pro-wrestling and how his school, the Snake Pit, is trying to help! WWE & Saudi Arabia, Bound for Glory fallout, plus Mark E. Xtreme invades! Scott, Jay & Jake are in studio for a MASSIVE episode discussing a ton of topics. They get in-depth about the situation regarding WWE's contract with Saudi Arabia and the details regarding their upcoming "Crown Jewel" - whether or not it should or shouldn't happen, alternatives & and potential consequences for going through with it. They also talk about Abyss' HOF speech, Smackdown's historic 1000th episode, the number one rules for wishes, oats, whether or not the show curses its guests, and they talk all about Impact Wrestling's Bound For Glory event and the backlash of Austin Aries' actions following the finish of the World Title match between him and Johnny Impact. And if that wasn't enough, the 15+ Year Undefeated BWE Champion, Mark E. Xtreme BREAKS INTO THE STUDIO in the middle of recording the episode! WWE SSD, Bound for Glory Preview, plus Austin Aries talks offensive tweets! 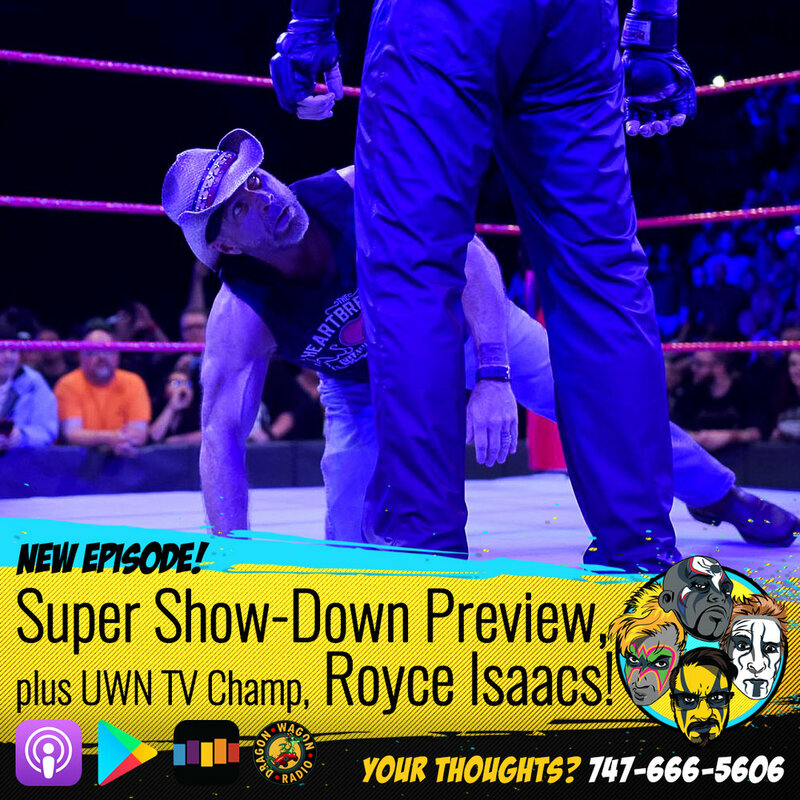 Super Show-Down Preview, plus UWN Television Champion, Royce Isaacs! Jonny, Jay & Jake are in studio with Dale on the horn, and it barely takes 5 minutes for this one to fall off the rails! After Jay tries to hijack Jonny's hosting duties and skip Dale & Jake's respective introductions, they eventually find themselves chatting about everything going on in the wrestling world including Pac's (aka Neville's) Return to Dragon Gate & Evolution's appearance at Smackdown 1000, Dale's experience at Progress Wrestling in Wembley, they answer a couple calls from the COMPADRES HOTLINE and preview this weekends WWE International Event, The Super Show-Down live from Australia! All of that PLUS Jonny & Jake sit down with the UWN Television Champion, Royce Isaacs in studio! 'The Kick', R-Truth, NXT Match of the Year, plus Toni Storm from MYC! Jonny, Jay and Jake are in studio covering everything that happened this week in the world of wrestling including the unfortunate accident involving Brie Bella and Liv Morgan and the backlash Brie has received as well as the workers who have defended her. They also talk about the brilliance of R-Truth (no really! ), what happened in Milwaukee, whether Dean Ambrose is bound for a heel turn, Pete Dunne and Ricochet's Match of the Year candidate on NXT and more! PLUS Dale sits down with Toni Storm from the Mae Young Classic! Hell In a Cell Fallout, Triplemania, Plus Lacey Lane interview! Jonny and Jake are joined in studio by returning guest Evan T. Mack and are covering all the wrestling news of the week including new matches added to WWE International Network specials as well as NEW WWE International Network Specials! They also dive into this past weekend's divisive Hell In A Cell event, cover the highs and lows and talk about what they expect and hope for in the fallout. 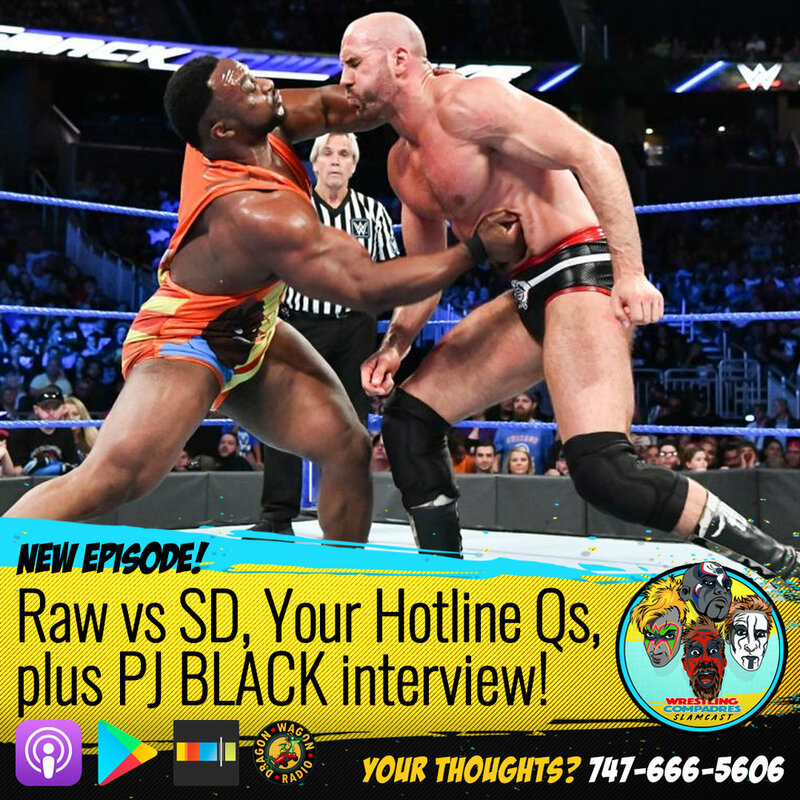 They also take some calls from the COMPADRES HOTLINE, talk about Philly Cheesesteaks, watching Scrambled PPVs, Jonny's belief of the paranormal, AAA’s TRAINWRECK of a Triplemania, and Jake's critical nature is called into question. All of that PLUS Dale sit's down with Mae Young Classic 2 competitor Lacey Lane from Full Sail Orlando! HELL IN A CELL Predictions plus Mae Young Classic's Kacy Catanzaro! Jonny ran late and there was a full on JAKEOVER as a hot headed Jake, Scott, and Jay covered all the happenings in the wrestling world this week including the "business" from ALL IN, Daniel Bryan's new contract, Renee Young's new role in the WWE, and Rick Flair's 90th marriage! Eventually Jonny does show up and the quartet take some calls from the COMPADRES HOTLINE, chat Mae Young Classic 2 and Impact as well as discuss this weekends HELL IN A CELL PPV and predict some winners as well as discuss what matches they're each looking forward to the most. All that PLUS Dale sits down with special guest and Mae Young Classic 2 competitor, Kacy Catanzaro! Jonny and Scott are joined by Sarah "The Rebel" Wolfe in studio with Dale on the line to talk all about this past weekends historic ALL IN event in Chicago. From it's highs and lows to surprises and memorable moments! They also discuss WWE's 2nd Mae Young Classic tournament which Dale and Sarah attended live last month. All that plus Dale sits down with MYC competitor and former WWE Diva's Champion, Kaitlyn! Raw/SD, ALL IN, Blackcraft Wrestling plus The Savage Gentleman & Lady Frost and Chris Dickinson! Scott, Jay & Jonny are in studio this week discussing the excitement surrounding ALL IN this weekend in Chicago, along with everything happening in the WWE and Impact Wrestling. And if that wasn't enough, we have not one, not two, but THREE special guests following the Blackcraft Wrestling PPV "Burning Bridges"! Chris Dickinson, The Savage Gentleman, and Lady Frost all sat down with Jonny following the incredible event in Pittsburgh. Scott, Jay & Jake are in studio joined by Dale via Skype - and they're talking about all the WWE SummerSlam weekend fallout including NXT Takeover and the SummerSlam event itself. Dale gives a first hand account from attending the weekend festivities and the gang rants about what they love and what they didn't from the biggest party of the summer. 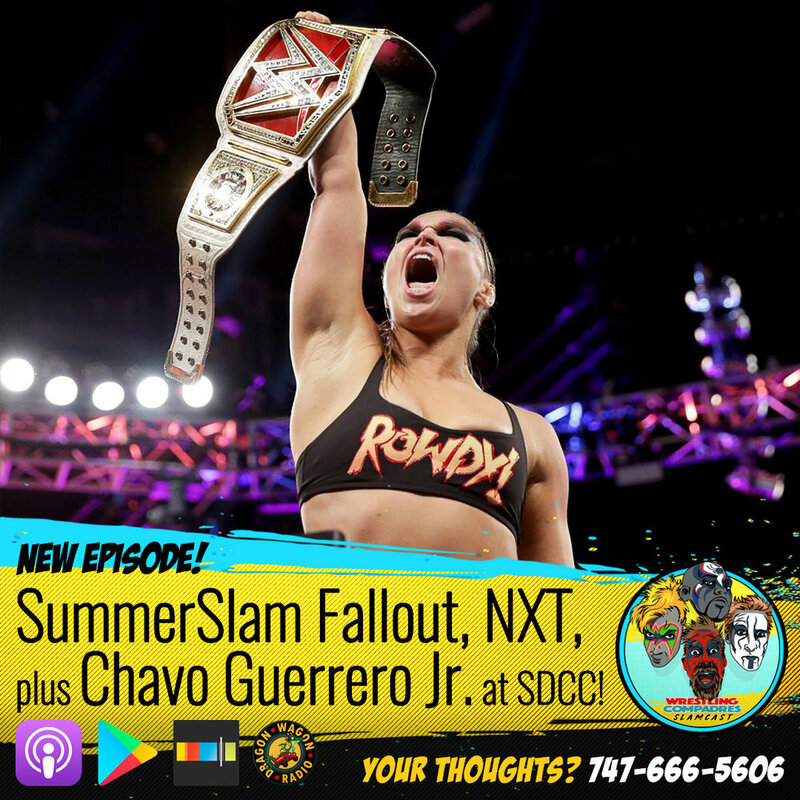 They also take some of your Compadres HOTLINE questions as well as chat with Lucha Underground's Chavo Guerrero Jr. at San Diego Comic-Con! SummerSlam Preview, plus Taya Valkerie interview! Jonny, Scott & Jay are in studio just days before the biggest party of the summer! No, not your Uncle Jerry's fourth of July BBQ... we're talking about SUMMERSLAM. The compadres are covering all the angles leading into WWE's second biggest PPV of the year including every title being defended, what matches they're most looking forward to, what they expect and what they expect to be surprised by! They also discuss the return to Brooklyn for NXT TAKEOVER, take a couple Hotline calls, and cover the week in IMPACT. All that plus a fantastic interview with Taya Valkerie from Lucha Underground from San Diego Comic-con! 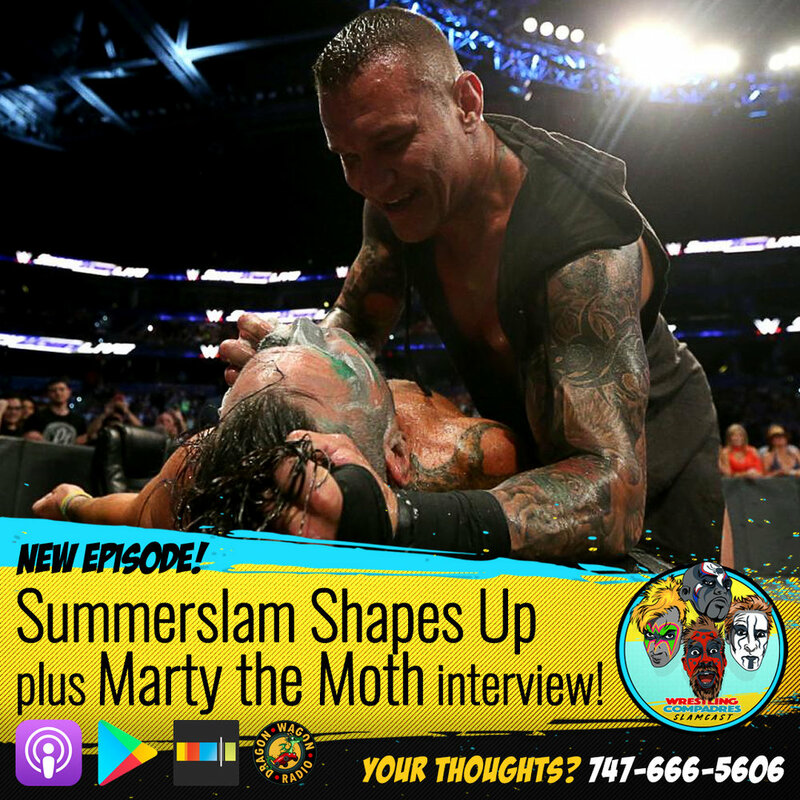 Summerslam Shapes Up, Twitter PC Policing, and Marty the Moth interview! Jonny, Jay, (and sometimes Jake) are joined by Evan Mack and discussing all thats happening in this week in wrestling including the PC policing of years old twitter feeds, the upcoming Mae Young Classic, Brock Lesnar's reading material preference as well his "turn" on Paul Heyman, the Smackdown Women's championship picture and Mella's Money Promo, the new NXT Champion, and Impact's impact! All that plus a MUST HEAR interview with the one and only Marty the Moth AKA Magnificent Martin AKA Martin Casaus! And if that's not enough for you, we find out what's in Jonny's drink, discuss the IT factor of Jeff Goldblum AND meet the #DoodleMan! Jonny and Dale sat down with WWE Smackdown Live Superstar Becky Lynch for an exclusive interview live at San Diego Comic-con and you get to hear it on this weeks episode! If that's not enough (stop being so greedy), SCOTT NARVER IS BACK IN STUDIO joining Jonny and Jay and getting updated on everything he's missed out on (which was a lot). All that plus WWE announces their 1st ever all women event Evolution, Roman Reigns vs Brock Lesnar again at SummerSlam, would Sasha Banks or Bayley make a better heel, Impact Wrestling's Slammiversary XVI delivers, & lots more!